ON AUGUST 4th, 2017 WE COMPLETED THE 15TH EDITION OF SPURS! With funding from the National Institutes of health (NIH) and other generous private donations, the SPURS program was able to accommodate 25 fellows: 13 females and 12 males; 14 African–American, 7 Latino-American, 2 Asian-American, and 2 Caucasian. This year, we had 13 students attending schools in New York including nine from Columbia University, two from CUNY Hunter College, one from New York University, and one from Rochester Institute of Technology. The rest of the students attended schools from across the country: Howard University, Williams College, University of Chicago, North Carolina Central University, Bowdoin College, Emory University, Case Western Reserve University, Princeton University, Rutgers University, University of Houston, and Brown University. We received a record number of 191 applications this academic year. We partnered again with Prep for Prep and the Howard Hughes Exceptional Research Opportunities Program (EXROP) to integrate their students into the SPURS program. The 2017 participants are: Andrea Conde, Jordan Ferreras, Priscilla Daboni, Josselyn Barahona, Briana Davis, Brian Zhao, Zachary Cyrus, Chantel Acevero, Nasser Douge, Lord Hymeamang, Freddie Fabiano, Kenny Igarza, Diana Ortiz, Maria Polo-Pieto, Kaylee Wedderburn-Pugh, Bunmi Fariyike, Dina Sheira, Shannon O’Rourke, Cindy Osei, Omid Cohensedgh, Ogoegbunam Okolo, Audrigue Jean-Louis, Felicia Benoit, Kylie Pecord. "Using scRNA sequencing to form a molecular map of neuronal cells in the C. elegans nervous system"
"The Role of Secreted Frizzled-Related Protein-1 in the Inlfammatory Response of Allergic Asthma"
"Role of Ryanodine Receptor in Diaphragm Dysfunction in Huntington’s Disease"
"Ketamine as a Prophylactic Against Inflammation-Induced Depressive and PTSD-like Symptoms in a Mouse Model"
"Examining Molecular Changes in Mouse Models of Epilepsy in Hippocampal Area CA2"
The program began on Monday, June 5th, 2017 with an orientation led by Michael Holsey and Dr. Monica Goldklang. The students were given an overview of the program and were informed as to what is expected of them for the summer. In addition, administrative details were addressed including stipend disbursement dates, identification card issuance, and schedule of training sessions. All students received instruction in Laboratory and Research Safety from the CUMC Environmental Health and Safety Department. This comprehensive seminar educated incoming students on how to maintain a safe environment through hazardous waste management, biological safety, fire safety, the use of personal protective equipment and chemical tracking/safety. The special seminar series of the SPURS program met on a weekly basis, on Wednesdays, throughout the summer during which speakers were brought in to serve as role models and to provide insight into the students’ career development regarding medical/PhD programs, their medical school years and the important aspects on which to focus to ensure a successful academic experience. The panel of speakers included Former NYC Mayor David Dinkins, Dean Lee Goldman, Dr. Roy Vagelos, Dr. Hilda Hutcherson, Dr. Jaime Rubin, Dr. Edward Owusu-Ansah, Dr. Henry Colecraft, Dr. Steven Siegelbaum, Dr. Dennis Mitchell, and Dr. Jeanine D’Armiento. The Wednesday sessions also served as an opportunity for the program directors to monitor the students’ progress, address any issues or concerns, and connect. On Thursday and Friday, July 28th and 29th, Drs. Marks, D’Armiento, Goldklang and Michael Holsey met with the students each of whom gave an oral presentation of their project. Extensive feedback to each SPURS student was provided with guidance on the scientific content as well as presentation. In addition, students participated in an expanded mentoring session with students from Columbia’s Medical and Graduate schools – MD, PhD, and MD/PhD candidates. 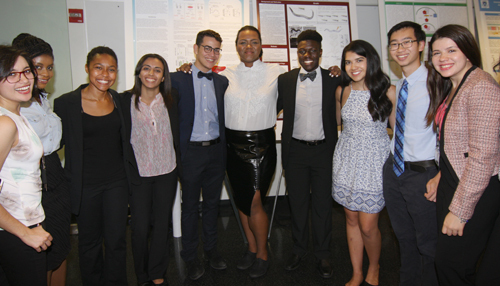 The 2017 program culminated on Thursday, August 3th, 2017, when each of the students presented their research in a poster session. This session was attended by mentors, post-docs, faculty, graduate students and family members. The poster session served as an excellent tool to help the students synthesize their 9 weeks of intense research. Uniformly, each of the students expressed their gratitude for the learning experience and opportunities offered by the SPURS program. On Friday, August 6th, 2017 each of the students returned to their laboratories to finish the program and thank their laboratories for the rich learning experiences this summer. Research reported in this publication was supported by the National Institute of Neurological Disorders and Stroke of the National Institutes of Health under Award Number R25NS076445. The content is solely the responsibility of the authors and does not necessarily represent the official views of the National Institutes of Health.